The Chromebook sports an 11.6-inch LED backlit display that comes in at 1366×768 resolution, which isn’t bad, but not the best. I noticed that the display looked fairly nice in use, but it did pick up some reflections if there was too much sunlight. One nice thing about the device is the 10-point touchscreen display that you don’t see on too many Chromebooks except for the Pixel and Acer’s C720P. Although Chrome OS isn’t as optimized for a touchscreen as say Android is on a tablet or smartphone, it still works very well and is both intuitive and easy to use. We’ll get to the hinge on the device later in the review, but if you have it rotated to the point where you can’t use the keyboard, there is an on-screen keyboard that’s just as easy to use as the Android keyboard. 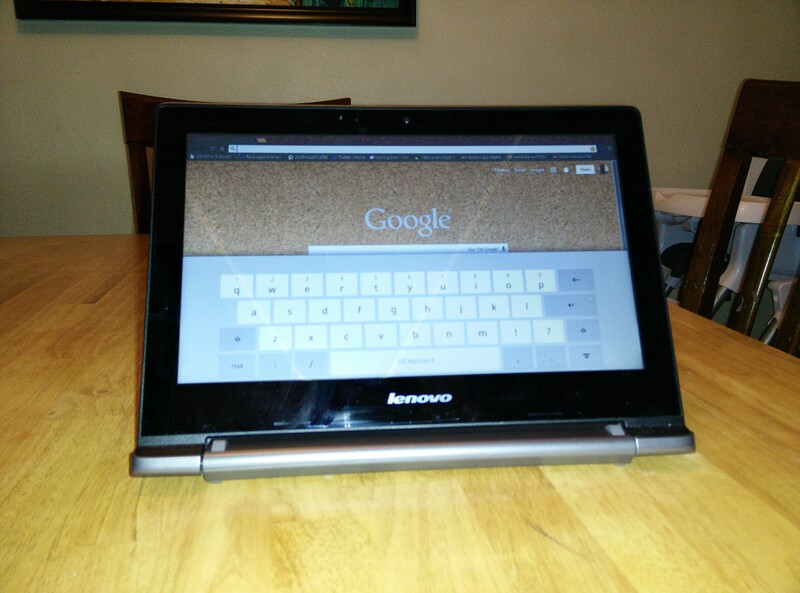 It almost makes me really want a Chrome OS tablet, but who knows if we’ll ever see one. Moving on to the other specs, one of the downfalls is the processor and it sports a 2.16GHz Intel Celeron N2830 with 2GB of DDR3L/1333 RAM. As you would expect, this dual-core processor isn’t the speediest, but provides more than enough to allow you to do some simple web browsing and running your Chrome OS apps. The Chromebook starts in under 10 seconds and has very fast browser tab/app switching, which could just be because of the OS. I noticed that after a while, the laptop starts to slow down and my solution was to restart, which again was only about 20 seconds total of my time. 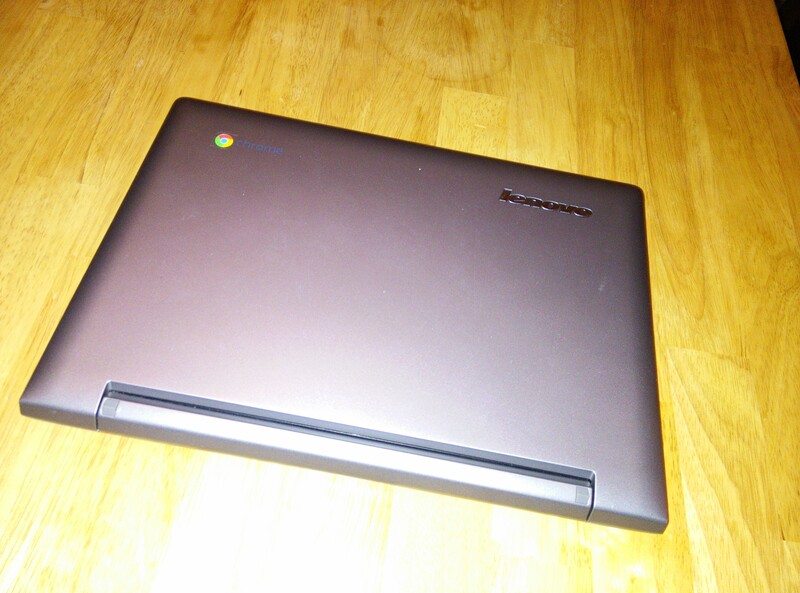 I still found the Chromebook to be too slow to be a full computer replacement and coming from a Core i7 Macbook Pro, the decreased speed is highly noticeable. The N20P sports a 34.8-watt-hour battery, which brings an impressive 8 hours of battery life. While it gets about 8 hours, depending on your settings you will get at least 6 or more hours and if you only use it slightly as a second computer while on the go, expect it to last a long time in standby mode. I found that in standby mode, it could last a few weeks on a single charge, especially since I would only use it for an hour or two at a time while on the go. One of the most unique features of the N20P besides the touchscreen is the ability to rotate the screen 300 degrees. 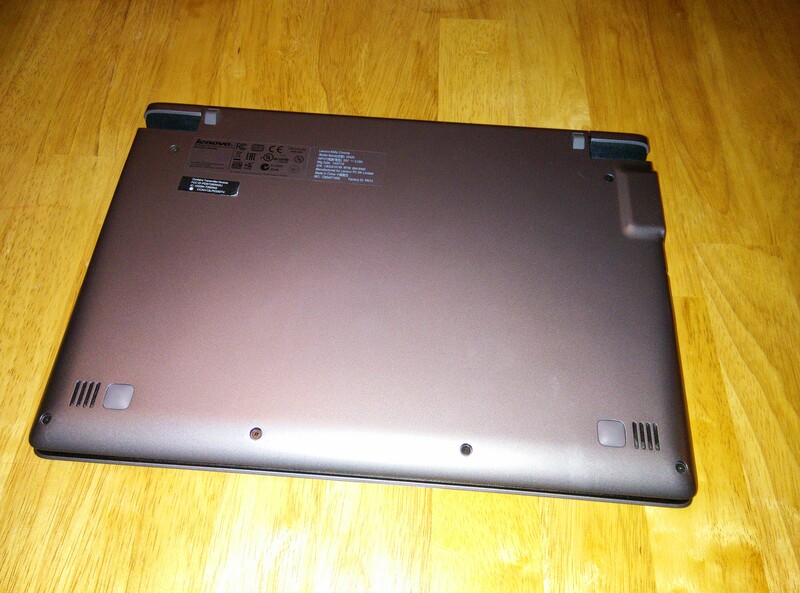 If you’re familiar with Lenovo’s Yoga laptops, this is no different. Rotating the display to 300 degrees or even a little less, it gives you almost a tablet with a stand. Having never used such a device before, it was a bit awkward at first, but then you get used to it. It makes the browsing experience all the better. It also has 16 GB eMMC storage, a USB 3.0 port, USB 2.0 port, HDMI-out and a 2-in-1 (SD / MMC) card reader. Lastly, as far as the hardware, the Chromebook is fairly thin and starting at 3.08 pounds, it’s easy to carry around with you. 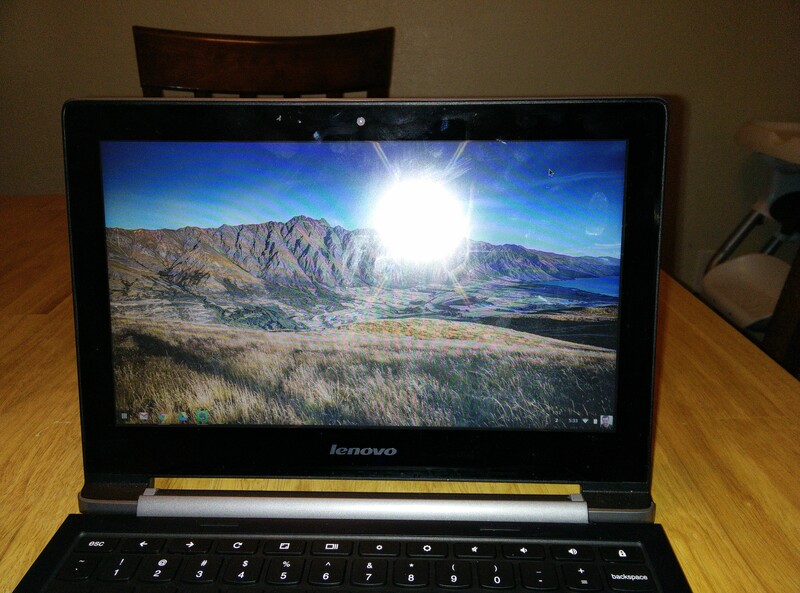 As with all Chromebooks, the N20P is running the latest and greatest version of Chrome OS and updates automatically. It’s the same OS as on all other Chrome OS devices and you should be familiar how to use it if you ever used a Chrome browser. As I mentioned above, one noticeable difference is that it has a touchscreen and therefore an onscreen keyboard, which works extremely well. One of the latest additions to Chrome OS, not specific to the N20P is that it the OS can now run Android app, although only four at the time of writing this. 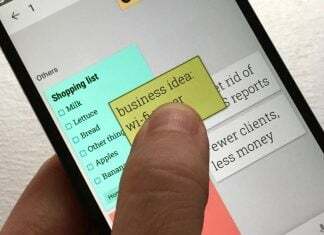 I got to try Evernote and Vine and both work just as you would expect on an Android device. One of the other downfalls I see with this Chromebook is that it’s a bit steeper than its competition, starting at $329, when most sell for under $200 and Acer’s touchscreen Chromebook can be had for $279. You’ll have to decide for yourself whether the touchscreen and 300 degree rotating display is enough to justify the price. 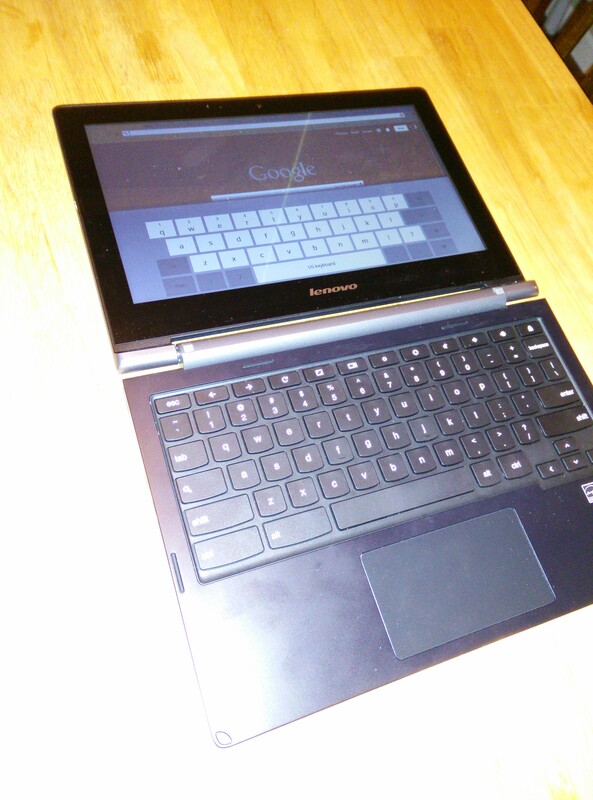 At its latest attempt at a Chrome OS device, Lenovo did an admiral job with the about 3 pound N20P. The viewing angles and display are more than adequate, it offers a great touchscreen experience and enough speed to run all of your Chrome apps, but at $329, it’s a bit expensive. 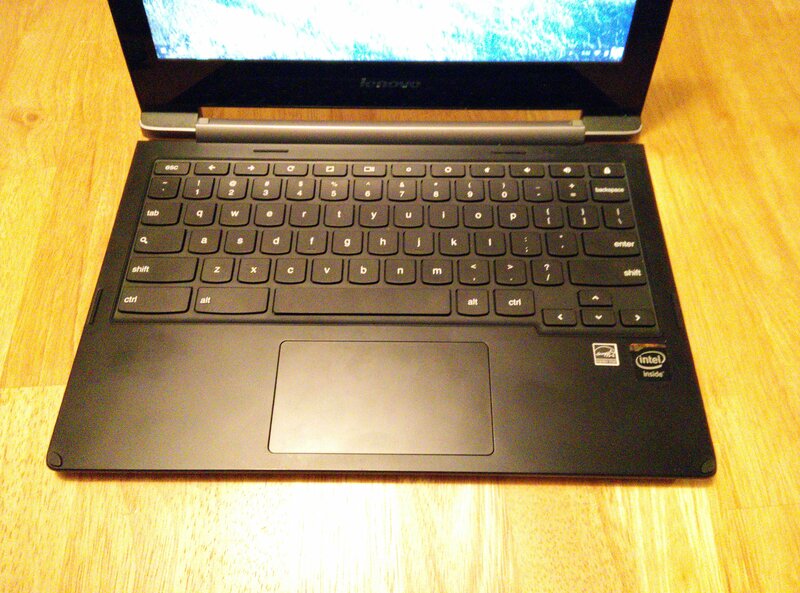 At $50 over the Acer touchscreen Chromebook, I would have expected a bit more speed. You can however get a little bit more speed if you buy the $349 model, which I didn’t have the opportunity to test. 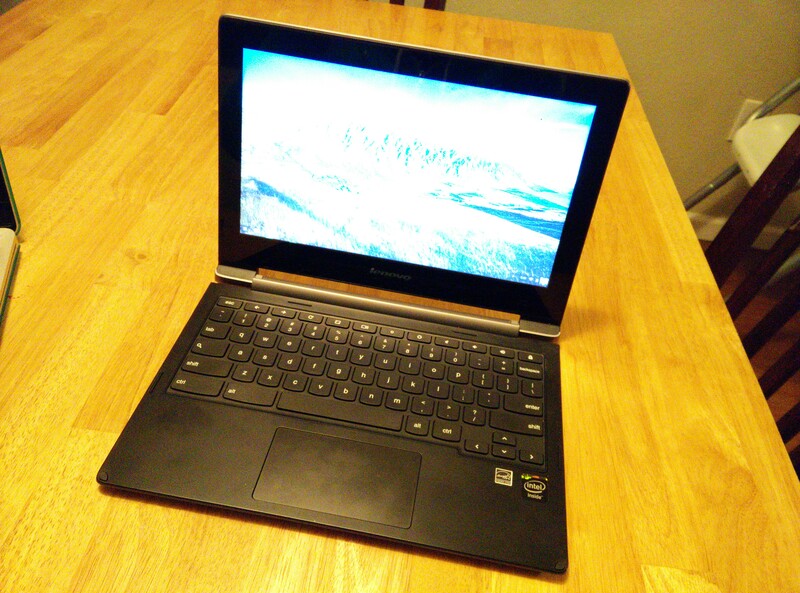 The premium model comes with a Intel Celeron N2930 processor clocked at 1.83GHz. 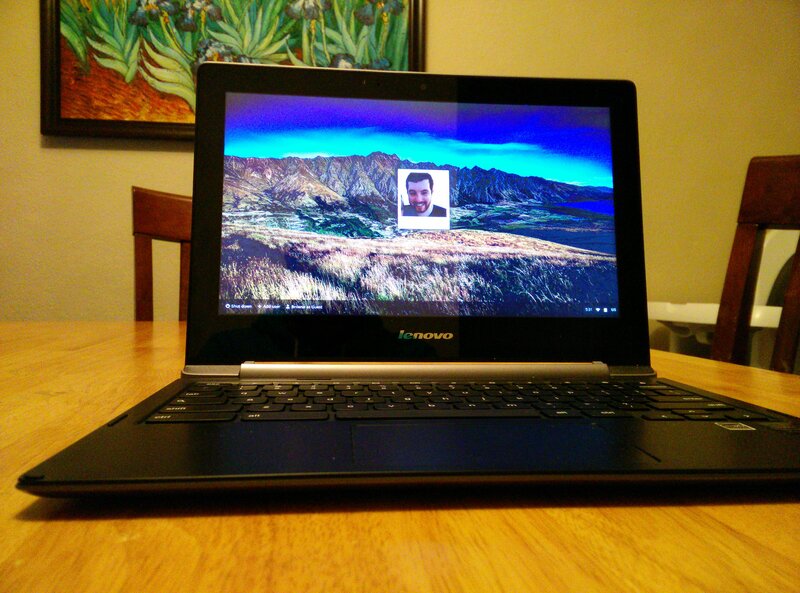 If you have the money to spare and really want a Yoga-like Chromebook with a touchscreen display, look no further.